Maamuni Mayan was the progenitor of Vaastu teachings. “He is none other than the Divine architect, scientist, technical wizard, poet and traditional builder, by name Maamuni Mayan” wrote Dr. V. Ganapati Sthapati. Maamuni Mayan was born on February 5th more than 10,000 years ago. Mayan’s name was “found in Indian epics of Ramayana, Mahabharata, the Tamil epic of Silappathikaram, Manimrkalai, Jeevaka Chintamani,” etc. Maamuni Mayan carved at Dr. Sthapati’s stone yard for Mayan Memorial. Photograph by Dr. V. Ganapati Sthapati’s office. 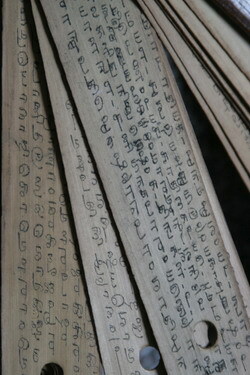 Original Palm Leaf of Vaastu Shastra. Photograph by Henk Sterenberg, Val Morin, Canada of 2007. So, Vaastu is a science based on several ancient works 10,000 to 15,600 years old and can be viewed as philosophy or psychology of Green building construction.